is a poem contrasting and comparing the themes and elements J.R.R. Tolkien (a devout Catholic) brought forward in his fantasy works and the persecution of the Catholic Recusants in his own native England. Since today is the feast of St. Margaret Ward, my confirmation name-saint and inspiration (the original "Pearl of Tyburn"! ), I dedicate the following poem to her. Before getting to the main poetic event, I wanted to mention that today is also the death-date of my late sister, Filomena Marie, who was born prematurely in Italy while my parents were on pilgrimage to the Shrine of St. Philomena. She lived for only fifteen days and then passed away soon after being baptized in a hurried emergency procedure. Although I do think it would have been lovely to have had a living sister (or even a brother, really.....), I do believe that she is in heaven and that she will pray for us here on earth. Plus, I'm happy to report I feel like I have adopted a lot of my friends as the siblings, cousins, aunts, uncles, etc. that I don't have. So where God closes a door he opens a window. "Through Hellish ash no one can see....."
I appreciated reading the tribute to your sister as well. I am sorry that she is not here - we might have been great friends as well! :)- but think it is great how your faith in God lets you handle the situation and trust that He knows best. I echo the birthday wishes to Ellen and Mary! As for the sword......wasn't the fact that it was broken represent the corruption of Aragorn's ancestor? Isn't that why it had to be reforged and all? Hence, I was thinking of England's "sword" having been broken by slaying the martyrs. Well, if you would just read the books you wouldn't have to go for therapy, because in the books you don't have to actually look at the battles. (Also, there are actually fewer battles, and they have more dialogue and less flying body parts.) Oh, you might be interested to know that I finally took the plunge and watched the theatrical version of "Return of the King" last weekend. The amount of very important material that was left out was sadly way too much, but overall I was glad I watched it - it was better than I thought it would be. Hmm, that is an interesting thought. I don't remember how they did it in the film, but in the book the sword was borne by Elendil, broke under him when he fell, and was taken up by his son Isildur, who used it to cut the Ring from Sauron's hand... so wow, yes, I guess that could make sense. Broken at the death of its heroic owner who died in an attempt to save Middle-earth, the hilt-shard of Narsil was used to take the Ring from Sauron, and the Ring has been more or less haunting Middle-earth ever since. But it was said that the Sword would be remade again when the Ring was found, and it takes another heroic owner who is willing to die to save Middle-earth to bear the remade weapon. So, I hadn't thought of it that way, but that is an interesting way of looking at it. I guess you're right! Yay! A poem that proves you understand the awesomeness of LotR!!! And to echo something Katherine said, I often did think of Gandalf and the other wizards as being representative of priests because of the power they wield. Okay, so the average priest doesn't throw fire from a walking stick, but when you consider that they forgive sins, erase Original Sin from the soul, and bring Christ onto the altar and bring Him to the people, I think that counts as powerful awesomeness points. It's a beautiful poem, Pearl! So now you're drawing historical parallels with LOTR - that's great progress! Congratulations! Katherine isn't on you like a bloodhound, by the way; she's just excited that you're finally starting to get it, and so am I ;). I need to back her up and add that she's right about this: if you would read the books, you would have no need for therapy:). You've told me many times that you think the movies are too dark and gruesome, but the books aren't like that at all!!! The movies add more death and tragedy than was in the books, and besides, one of the main points of the books is to demonstrate how God can bring good out of evil. The characters' virtue and heroism, with the aid of Divine Providence, triumph over evil at the end, even though not everything turns out they way they hoped it would. Also, please realize that you've had no exposure to Tolkien's story at all; you only know Peter Jackson's extremely faulty interpretation of it. The reason I keep stressing that point over and over is because all the changes Jackson made significantly mutilate Tolkien's message and the characters' personalities. In some cases, even subtle differences that are difficult to notice at first glance do a lot of damage when you consider the cumulative effect they have on the story - that's a subject Katherine and I have analyzed extensively. Ask us about the Breaking of the Fellowship sequence, Elrond's behavior, and the relationship between Frodo, Sam, and Gollum;). I just don't want you to get the wrong impression of the characters because of Peter Jackson's ignorance - he's stripped many of them of their innate nobility, courage, strength, maturity, you name it. Sorry if I'm rambling too much. Katherine and I just honestly have trouble understanding why you insist on sticking to the movies only when the books give you a much less violent, depressing picture! None of your complaints are found in the books. Thank you so much for the birthday wishes! But I'm sorry to hear that your sister passed away on my birthday. I'm sure she is in heaven with my three siblings, and they're all praying for us together. @Katherine: That's nice that you took the plunge into the final film in the trilogy. I found it to be the most intense and disturbing of them all, although there were some truly inspiring sequences, such as Arwen's vision of the child she and Aragorn would have together and her decision to remain in Middle Earth, Aragorn's speech to the "Men of the West" before the Black Gate, and Frodo's agonizing crawl up Mt. Doom in hopes of saving his beloved Shire. What were your favorite parts? @Ellen: Thank you also for your kind reception of this piece! But I wouldn't say I haven't had any exposure to "Tolkien's story" at all; after all, as much as Mr. Jackson may have diverted, he's taught me much more than I ever would have known if I waited to get time to read the books! Besides, when it comes to fiction, I usually prefer film to book, whereas when it comes to non-fiction, I usually prefer book to film. Nevertheless, I will grant that reading to LotR books would probably be a good idea at some point in the future. However, it's all a matter of time, and I don't have a whole lot of it at present! Yeah, you really should take the time to read the books once you do have some time because the book is ALWAYS better than the movie. ALWAYS. It's an unwritten rule of life. Favorite parts... When you heard the horns and realized the Rohirrim were about to charge. That was almost as awesome as I had imagined it. Gandalf charging into battle on Shadowfax with that light to save Faramir. 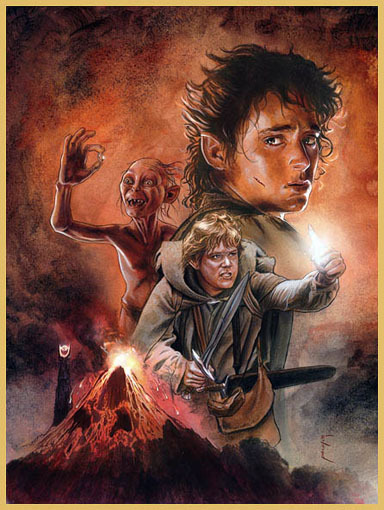 Most of the Mount Doom sequence (that is, all Sam's and Frodo's interaction there, Frodo crawling up the side of the mountain and Sam carrying him - not the way-too-long battle with Gollum). Merry and Pippin being the first to charge after Aragorn. Pippin shouting "The Eagles are coming!" The Fellowship reunion. That moment in the Green Dragon between the four hobbits. Some of my favorite parts of the book were missing or mutilated (actually, a LOT of my favorite parts of the book), but all those parts I liked. I couldn't believe what they did to the Battle of the Pelennor Fields. They left out all the dialogue! And I sure don't remember the Nazgul swooping around like bats, picking people up and dropping them... nor Gandalf hollering, "Aim for the trolls!" Nor Legolas climbing around on elephants. : ) The "Paths of the Dead" sequence was all wrong, too. And Eowyn and Faramir were really cheated. As always, neither Ellen or I are trying to put anything but friendly pressure on you. But - really, all three of us (Ellen, Emerald, and me) who have both seen the movies and read the books agree that there is simply no comparison between the two. When you read the books for yourself, you will know what we mean. It's not the plot changes that are so crucial as the emphasis on action instead of crucial dialogue, and the character changes. Most of the characters are just plain more noble and likeable in the books, so I think what Ellen was pointing out was that many of the movie characters are only shadows of who they are in the books, and that the things you don't like about the story seem to be the very things that the movies emphasize and expand upon.